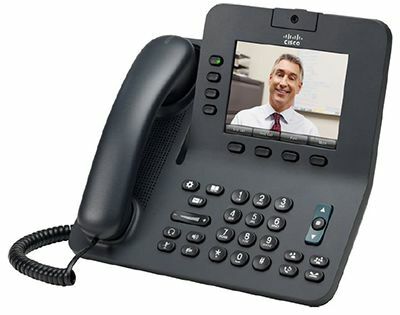 Cisco's 8945 IP Phone renders video on its high-resolution, 5-inch diagonal, fully backlit, VGA-quality display. The phone supports four lines and four context-sensitive soft keys along with a high-definition voice, full-duplex speakerphone for a more productive and more flexible endpoint experience. Fixed keys for hold, transfer, redial, and conference; a tri-color LED line; and feature keys also make the endpoint simpler and easier to use. The Cisco Unified IP Phone 8945 offers greater personalization with two handset style options. In addition, Bluetooth 2.1 support is delivered for additional freedom using headsets, such as the Jawbone ICON for Cisco Bluetooth Headset. It also supports right-to-left language presentation on its display, addressing the language localization needs of global customers. The endpoint also comes with an IEEE 10/100/1000 network and PC ports, reducing costs with the ability to consolidate wiring infrastructure at the desktop. With these integrated ports, the multimedia traffic from a co-located PC can be routed through the integrated switch of the phone and then sent back to the closet switch over a single cable-drop. The Cisco 8945 IP Phone supports a deep-sleep option, offering energy savings with reduced power draw during nonbusiness hours. In addition, the phone employs use of both recyclable and reground plastics for a more earth-responsible solution.